After a spring of seeding and transplanting, it’s finally harvesting season. Each week I eagerly walk the garden rows at Heifer Farm in search of what’s ready: greens and cool weather crops, roots and ever-prolific beans and squash, and soon enough tomatoes, corn and melons. Visitors at Heifer Farm help harvest carrots. carrot out of the ground is often a brand new experience for folks, and the response never fails: a big smile and a triumphant hoisting of the carrot into the air. Sometimes there is a gasp of surprise when the carrot isn’t orange but instead white, yellow, pink, red or purple. In the garden we plant multiple varieties of more than 50 different crops. Varieties of vegetables have distinct characteristics, like breeds of dogs. We grow more than 20 varieties of tomatoes alone—some withstand disease pressure and others produce well in cool, wet summers. Some are best for tomato sauce and others for eating fresh. There are red, purple, black, green, yellow, orange or variegated fruits. Some are round but others are oblong, lumpy, heart shaped or bite-size. The Garden Peach variety is even fuzzy! Two-dozen tomato varieties just scratch the surface; indigenous farmers in Peru grow more than 5,000 types of potatoes! In any ecosystem, biological diversity equals strength. Growing many types of plants is called a polyculture, a safeguard against the unpredictability of nature. 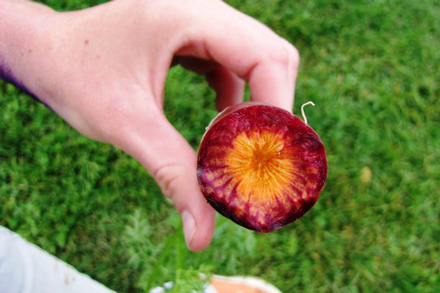 A purple carrot, freshly harvested at Heifer Farm. In addition to crop security, polycultures improve soil, attract beneficial insects and pollinators, and break up weed, pest and diseases cycles. It also means more interesting food for us people, adding a cornucopia of nutrients, flavors, textures and colors to our plates. The produce aisle of a grocery store may seem like it has everything, but peruse a seed catalog sometime to see just how many options are missing. Unfortunately it’s estimated that we’ve already lost over 75% of the diversity in our food seeds, but there is still time to preserve what’s left. Plant some new varieties in your garden, shop at a farmer’s market or ask the produce buyers at your grocery store to stock some untraditional items. We live in a world filled with diversity—people, cultures, climates, geography, animals, plants, fields and food. That’s definitely worth celebrating with a carrot raised into the air, so until next time: cheers! Interested in the goings-on at Heifer Farm? Submit your gardening questions, thoughts or ideas for future posts to elizabeth.joseph@heifer.org.